Like many consulting firms, Highland Solutions groups our team into several practice areas. The CRM practice distinguishes itself from the other Highland practices by focusing only on CRM (of course!) and by supporting multiple active clients instead of a single client’s custom development initiative. These clients range in size from family-owned custom fixture businesses to global manufacturing firms. We have a small but experienced team of dedicated CRM experts at Highland Solutions who support about 25 clients. So how do we do it? Here are 6 guidelines that help us work at a sustainable pace while delivering excellent work to our clients. This work varies in its predictability (how far in advance can it be scheduled?) and its unknown risks (how well can it be defined before we start?). As a team, the areas of greatest risk are usually prioritized higher, as shown in the matrix below. We take time on Monday mornings to review the week ahead and rank by client and type of work. Highland is a people-first organization. We are spouses, parents, friends, and caretakers, as well as technology professionals. Like you, we have a limited number of hours in our day and we don’t spend all of them working. When we are working, focus is critical to quality and completion. 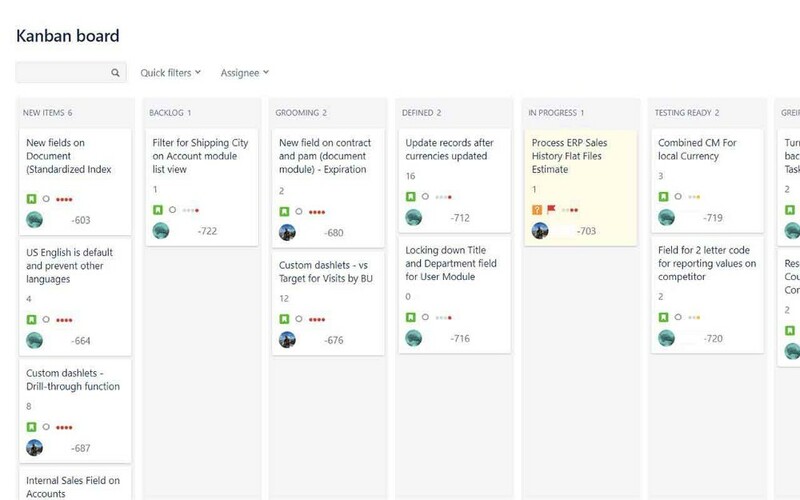 Context switching between Jira stories, client meetings, and internal tasks can be taxing, so we limit the number of stories assigned to each team member at any given time. We use Jira quick filters to highlight what’s assigned to whom at stand-up. We don’t prepare a large requirements document up front. 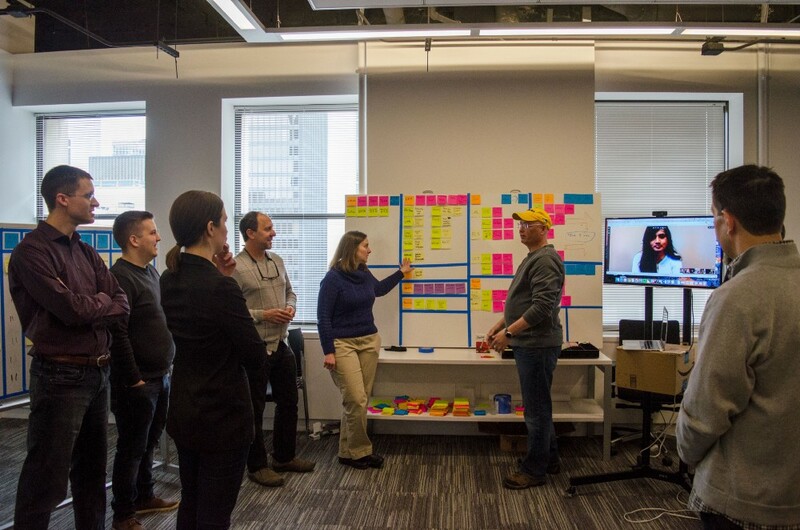 We educate our clients on Agile software development during our kick-off meetings, and we shepherd our joint team through a rapid story definition, implementation, and demo cycle. We present changes and enhancements to clients early and often, and we turn around feedback quickly. This shorter cycle keeps the information fresh in the minds of Highland team members and our clients. Our clients are often busy sales and marketing professionals with day jobs that are not configuring CRMs. Keeping their focused attention and reminding them frequently of what we’re doing on their behalf results in more valuable feedback for us and a better end product for them. We can’t afford to have every team member become an expert in every client’s CRM, so generally there are one or two experts per client. That said, some cross-training provides benefits when we need to spread out testing tasks or when a team member takes time off. We also use a secure tool to save and share credentials, ensuring we can access clients’ Sugar CRM environments without passing around usernames and passwords on post-it notes. From internal daily stand-ups to weekly or bi-weekly client demos, the importance of communication cannot be overstated. We are committed to being transparent and open with our clients and with each other. Occasionally we will miss a deadline or misinterpret a requirement, but frequent check-ins ensure that trust remains high and corrections are timely. Every CRM engagement is a partnership, and candid communication is the strong fiber binding us together. Taking the best from Agile methodologies, lean principles, and about 50 years of collective technology experience helps Highland’s CRM team keep our day-to-day workload manageable while still delivering high value to our clients. While these guidelines help us manage our work today, we’re always improving our process and tweaking it as our needs change. If you lead or work on a team that’s managing multiple clients, leave me a comment and let me know how you’re applying Agile or lean principles to your work.